Welcome to Beyond The Letter. This website & blog is about the journey of spiritual transformation. And since you found it, I’m guessing you’re a fellow traveler on a journey of discovery as well. It is my hope that these posts and articles, plus the dialogs that may follow, will help each of us travel deeper into our true nature (which is often hidden by cultural conditioning and self-deception). I believe as we unlearn those things, we grow beyond our ego and its self-imposed limits. In the process, our hearts and minds are being born again. See if any these posts and articles make sense to you. If you do recognize something as truthful, I’d guess it’s something you already knew. You are just recognizing (re-knowing) what your authentic self has known all along. When we first meet each other, often somebody will ask, “what do you do?” Meaning what do you do for a living. So let me get that out of the way first. I’ve been doing advertising design since graduating from college in 1980. So I could tell you that I’m an art director. I enjoy designing and solving client’s communication issues. But there is another answer to “what do you do?” That answer had been a little secrete of mine for several decades. My wife didn’t even know about it. I didn’t want her or anybody else to think I was crazy or weird. Finally I let her and a few other people in on my secrete. 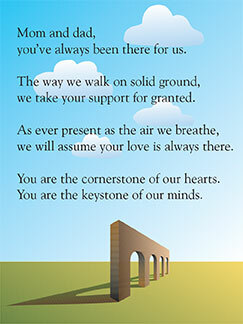 I finally “came out of the closet” when I gave my mom & dad an illustrated poem that I had written for them years before. I had a yellow sticky note reminder to do this; and I kept moving it from month to month, year to year. Then I couldn’t take it any more – all this unfinished stuff that filled so much of my life. So I framed it and gave it to them one evening at our family’s beach cottage. At the same time, I handed out copies of some of my poems to family members sitting around the cottage’s dining room table. I remember standing back as they were reading; feeling naked in the room. Totally exposed. Waiting for a reaction. After that beach weekend, I started sharing my poetry with other people. Folks like a retired Colonel/minister and his wife who rented a house from us. While over there fixing various things for them, we would have very interesting conversions. Things about the military and our connections to Ft. Bragg, the Philippines, etc. (I grew up in a military family, and have lived and traveled in many countries.) And we shared our spiritual connections. After her brother’s death from cancer, I dropped off some flowers and some stapled sheets of my spiritual poetry. Perhaps a year later, I was over there repairing something, and saw my poetry sheets on her night stand. This woman had read a lot of well-known books about religion and psychology, so I was happy to see she kept my poetry. I mentioned this to her, and she said she liked to read one of my poems before going to bed sometimes. This got me to thinking maybe I needed to do something with all this stuff I’ve been writing. So I started handing out copies to religious leaders in our area, and I was pleasantly surprised with the responses. That encouragement eventually lead to the publishing of my spiritual poetry that spans a ten year period. I’ve continued my writing habits since then; and that is why I decided to start sharing through this blog.